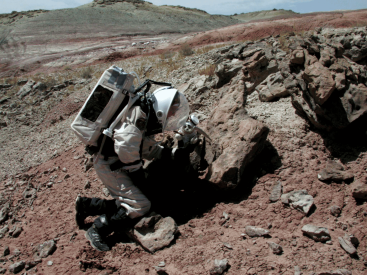 Dr. Penelope J. Boston collects fossil specimens During Mars Simulation. Like the organisms that she studies, Dr. Penelope J. Boston, SLIME Team Scientist, could also be classified as an extremophile. Her dedication to researching these mineral-eating microbes has taken her to some pretty extreme environments. So far, it seems, there aren't many places that she won't go to learn more about the unusual life forms that exist where nothing else can. In April 2002, she added another extreme environment to her list: Mars . Well, almost Mars. Dr. Boston, "Penny" to her friends and colleagues, joined a team of researchers to form Crew #6 of the Mars Desert Research Station (MDRS) located in Hanksville, Utah. 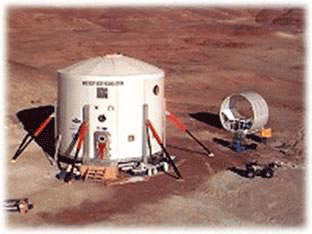 At the time MDRS was one of two living laboratories operated by the Mars Society, an organization co-founded by Dr. Boston and dedicated to the exploration of Mars. For two weeks the crew, who had only met through online planning, lived together simulating a research mission on Mars. "This research may have provided some of my most challenging circumstances yet," says Boston. Following is a chronicle of her virtual Mars experience. The crew met via teleconferences for two months before their simulated visit to Mars. During these conversations, they discussed research activities, planned meals, assigned duties, and basically got to know each other. Penny conducted extensive preparation of field and lab equipment that would be used at the MDRS site. "I worked a great deal on trying to take tools that could be used for field collection that were usable with simulated large and clumsy space gloves on. What a trick!" she says. Because space is limited in the simulation module, crewmembers could not take much with them. In addition to the essentials, Penny brought along a few small comforts like butter mints, books, and Pooky, a stuffed bear who has become her Research Assistant for most of her expeditions. In fact, Pooky has her own space suit and actually became the seventh crewmember on this mission. Penny uses Pooky's adventures to explain science to young children at public outreach events. Pooky also has her own caving gear. In addition to Penny, the crew included architect and guitarist for the rock band Divo, Frank Schubert who was the "Mission Commander;" planetary scientist, Kelly Snook; filmmaker, Sam Burbank; microbiologist/patent attorney, Steve McDaniels; Ephimia Morphew, a psychologist at Johnson Space Center; and of course, Pooky Boston, science assistant. Each crewmember had his/her own expertise and research agenda. Their goal was to merge their ideas into a comprehensive plan that would achieve all of their objectives. Fortunately this group, according to Penny, "clicked amazingly well together. It became a real family. Not all crews are like that." The Crew 6 mission patch shown here was created by R. D. Frederick. The MDRS "Hab," as it is called, is a two-level silo-shaped module that is approximately 24 ft. in diameter and sits on a pair of landing struts. One level consists of the laboratory, bathroom, shower, storage, and the airlock compartment. The second level hosts the kitchen, common room, a meeting room, and six small compartments where crew members sleep and retire for a bit of privacy. Although exact simulation is impossible on Earth, the set up is pretty representative of many designs that have been developed for early human Mars missions. The Hab is located on several acres of remote land about 20 miles outside of Hanksville, Utah . It is secured with locks and watched closely by local townspeople nearby. The MDRS Habitat in Utah. The remote area where the MDRS is located is very much like Mars in both geology and some aspects of the climate. 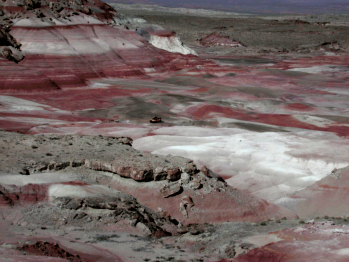 The area is similar to the landscape of Mars in color, lack of vegetation, and unusual rock formations. The climate is dry and cool much of the time that the Hab is occupied (late November through early May). The summer is too hot and no crews are in residence during the rest of the year. During a two-day long windstorm, the landscape looked just as scientists imagine Mars would look like in one of the massive, global, and years-long dust storms that actually occur on Mars. This, and seeing a full moon over the desert as they looked out the dark window ports were unforgettable moments for the crew. Another special feature of the mission was setting up a remote habitat (a tent) on an overlook above the Hab area. While inside the habitat, they were allowed to remove the space suits and relax in their normal clothing. During their "field trip," they studied the natural fluorescence of various minerals and desert organisms. They were also able to enjoy serenity of the evening outdoors and the stars against the dark skies without the interference of city lights. give an unearthly landscape for the MDRS simulation. During their EVAs (Extra Vehicular Activities) a.k.a. "space walks," the crew members were required to wear a full space suit to keep the simulation real. The suits are heavy (about 30 pounds), cumbersome, and limit one's extent of vision. Penny found that just performing ordinary tasks became unmanageable while wearing the suit. Using the scientific tools was almost impossible. "I thought that I had planned for every circumstance, however I've never worked in a space suit before. This proved to be more difficult than I thought. I had to rethink normal movements as well as try to manipulate the tools used for my research." Although Penny had created some special tools for the trip she was continuously adapting them during the simualation. NASA Pschologist, Ephimia Morphew in airlock at the MDRS Hab. The crew stayed in simulation continuously with only a few necessary adaptations. One of the most realistic aspects of the simulation was being in airlock. The crewmembers had to stay in the airlock chamber for 20 minutes when entering and exiting the Hab, the approximate time it would take for a real airlock to be evacuated or refilled with air. Each crewmember was assigned daily "household" chores as well as professional duties. Penny was in charge of filling out many of the daily mission log entries recording the various discoveries and accomplishments throughout the mission. To read the daily log entries for this mission visit http://www.marssociety.org/mdrs/fs01/ . She was also responsible, in part, for meal preparation. This proved to be quite a challenge. Prior to the trip, the crew decided to eat a macrobiotic diet (a holistic diet centered around whole grains and beans with very specific cooking practices) for the two-week mission. With primitive cooking technology, even traditional meals take more time, add in the complexities of macrobiotics and the meals take about 16.5 hours to cook and clean up after each day. In hindsight the crew decided that the macrobiotic idea wasn't such a good idea. They basically found that the simulation experience was enough of a shock to their world and changing their diet only made it more so. Although the crew did keep in contact with Mission Control on a regular basis, contact with the "outside world" was limited during simulation just as it would be on a real Mars mission. Crewmembers were able to communicate by email with a 45-minute Mars time delay. As in real space missions, problems occur. The first, for Crew #6, was an unfortunate toilet mishap. The composting toilet, which is usually kept in equilibrium with the outside temperature, was not functioning properly and therefore, the waste from the previous mission did not degrade. Needless to say, this was an unpleasant beginning for the mission. As it turned out, the toilet could not be repaired in simulation so buckets were brought in as substitutes. For Penny, who is used to living in the extreme depths of caves, the bucket was not a big deal. Some of the others thought differently. In addition to the toilet, some of the technology and tools occasionally malfunctioned and had to be repaired using only what they had in simulation. With this being the first year for the MDRS there were still some "bugs" to be worked out in the module. Handling mishaps while in simulation only added to the learning environment and the bonding ability of the team. One of the more dangerous mishaps was an ATV accident for Penny that caused extensive injuries to her ribs, hip joint, head, and ear. The cumbersome suit and heavy boots were not ideal for driving an ATV across the desert terrain and a boot became stuck in the ATV gear mechanism. This also proved to be a learning experience for the entire crew and allowed them to make some safety improvements for future missions. Fortunately, the injuries were not life threatening for Penny and she chose to continue the mission and play the role of the injured crewperson. Again, Dr. Boston is as dedicated as they come. The simulation was adapted to the circumstance. Pooky Boston studies organic leaching zones in sandstone. The types of research during mission #6 varied. The two primary studies focused on the extremophiles in and on the rocks and a music collaboration experiment. The ICoMP, Interpanetary Collaboratory Music Project, involved creating collaborative music between the crew and musicians on Earth with a simulated Mars time delay built in. It was a human sociology/creativity project. A multi-part psychological evaluation was also conducted to record how the human interaction evolved during the two-week simulation. And, of course, extremophiles were studied in-depth and brought back to Earth for further research. Desert varnish , a dark coating on rocks rich in minerals and microbes, was of particular interest because it is similar to rock coatings that appear to be present on the Mars surface; as recently shown by the MER (Mars Exploration Rovers) actually on Mars. After two weeks of isolation on Mars, Crew #6 headed back to Earth. Penny describes her Mars simulation as "an amazing experience" that far exceeded her expectations. The mission was much more instructive than she originally thought it would be. "The overall experience, more so than the science, proved to be invaluable," she says, "Experiences like these are quite a rush. They show what you, personally, can endure and accomplish." Penny has been back to the site to collect more samples for the extremophile research. She does plan to return to the MDRS in the future, but probably will not live in simulation again. Would she like to visit the real Mars someday? Absolutely! If the opportunity were presented in her lifetime, she wouldn't hesitate. The universe is her laboratory and the more extreme, the better for Dr. Penny Boston.